The Wadhams to Avoca Trail utilizes more than 12 miles of a historic rail line formerly owned by the CSX Company. The trail offers a variety of opportunities for walkers, rollerbladers, bikers and even horseback riders. The scenic beauty of the Wadhams to Avoca Trail also makes it great place to do some bird watching or see the fall colors. 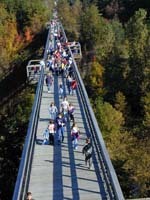 The centerpiece of the trail is the 640-foot long Mill Creek Trestle. 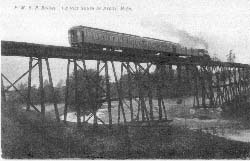 Built in the late 1800's, the 60-foot high trestle has been decked and railed to provide safe access for walkers and bicyclists. Four overlook areas have also been installed on the trestle so the trail users can enjoy the beautiful views up and down the Mill Creek Valley. At the south end of the trail in Kimball Township, over of 5 miles of trail have been paved starting at McLain Road running southeast to Griswold Road. The paved section of the trail passes through a developing residential area and is already being heavily used by residents. To insure user safety, a traffic signal was installed at the Wadhams Road crossing. To learn more about the Wadhams Road crossing, click here. Designated off-road parking areas are located at the Wadhams Road, Lapeer Road, Imlay City Road and Avoca Road Trailheads. While on the trail, please be courteous of neighboring residents and cautious of on-road vehicles.